Hamilton re-tooled it's CLD line in 1953 and replaced many of the original models with new models. Like the original lineup, the new CLD watches were "sealed" with a series of gaskets that included the stem - making them more protected from dust and moisture. The Lyndon was introduced that year and was manufactured for only two years. 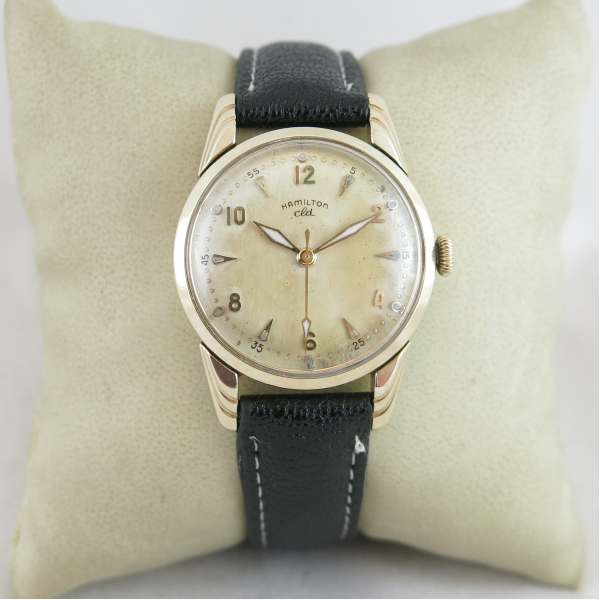 These second generation CLD watches were larger than their earlier siblings and the Lyndon is a nice sized watch. The 10K gold filled case has very interesting stepped lugs that almost look like wings and a bubble back - making it comfortable to wear. 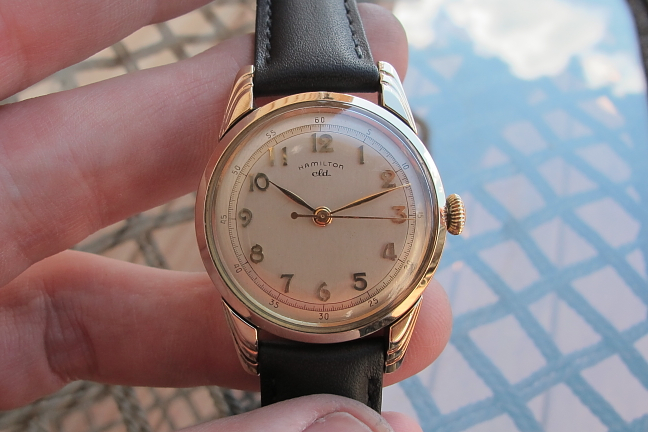 Two different dial options were available - either with solid 18K gold numerals with a second track or with numerals and luminous markers and dots (with luminous hands). 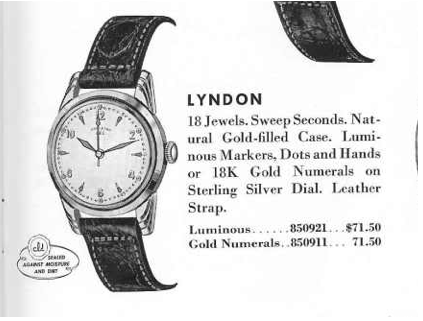 The Lyndon utilized Hamilton's 8/0 sized 18 jewel 748 movement with a central sweep second hand. The case is often found with wear through on the stepped lugs and on the reverse near the crown. However, good examples are relatively easy to come by. I think the numeral AGN dial is more common than the luminous marker dial shown in the catalog ad above. I like the Lyndon and enjoy wearing it when it gets it's turn for some wrist time. Here's a luminous version of the Lyndon. It's less common than the AGN version and just as interesting. 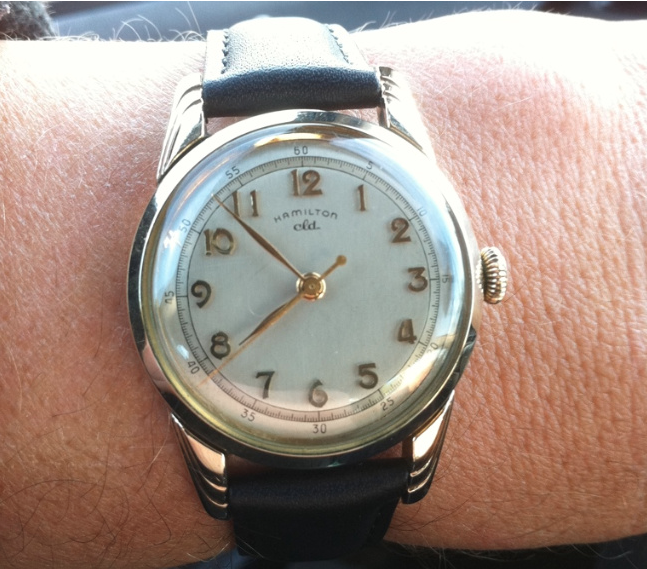 I recently inherited my grandfather’s wrist watch. It might date from anytime from the 1920s to 1962. It looks almost exactly like your photo of the 1953 Lyndon CLD. The only difference: underneath the “Hamilton” logo there is no “CLD” mark. The short answer to identifying it for sure is to take it to a jeweler, have the back removed, and record the model/serial number. I will do so eventually. If it looks that much like a Lyndon it probably is... but I bet it has a refinished dial and the CLD didn't get put back on. I need the crown of this model where I can get it? Email me (by the contact info above of thru Etsy). It might have one. This looks like the one I have of my Dad's, except it doesn't have the "stepped lugs". It was given to him as a wedding gift in 1952. Did they make a similar model in '52? It could be a "53, because they were married in December '52 - the news models might have been out by then. Thanks. Does yours have CLD on the dial? If not, there are several similar models that are not CLD's, such as the Rodney. If yours is solid gold, there are even more options. Yes - it does say cld. It does appear to be gold - i don't know about "solid" - but it does look like real gold. Although it runs great, it looks very old. The face is discolored. But I think that adds to its vintage charm. Thanks for the reply! Do you know anyone who can do a dial refinish on my "Lyndon"? I'm sure International Dial Co could do it. The luminous dial could be a challenge because of the pearlized track but they can do it. Dan, I just purchased a Lyndon on Ebay that winds, but the female part of the stem is broken. Do you know a good place to get a replacement, or the parts number for the 748 Stem? Thanks. Didn't mean to post as "Unknown." My name is Mike. Thanks for your time. All of the CLDs use the same tap 10 stems except the Brandon, it's a larger tap 8 stem. It's part number 615270. These female stems don't snap onand off like the later design. You have to lift the movement out, sort like those old wooden train tracks. If you try to pull the female portion away or snap it on, you will break the stem. Pop the bezel off to reveal the dial, etc. The joint in the two-piece stem will be visible. Orient the stem to see the joint and lift the dial and movement straight up and out.